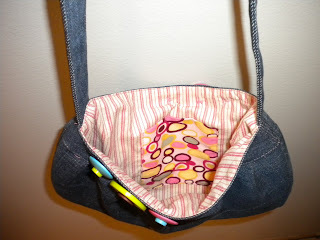 While cutting up an old favorite pair of worn-out jeans for another project, I noticed I had just enough material left over to make this cute purse pattern I found online. 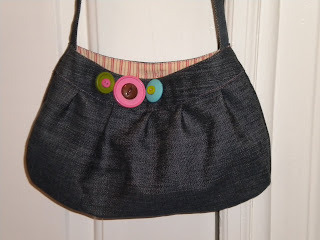 I made a few changes to it, though--longer strap, sewed the strap into the lining instead of to the outside of the bag, eliminated the tab with two buttons, and made my own decorative button design. It's for my daughter's friend's birthday, so it's kind of girly. But a great way to recycle jeans! I think you're a genius and a very good seamstress. I like your new blog. I love this blog! Maybe it will inspire me to do something more than wash dishes and fold clothes. That's about the extent of my womanly industry these days! what a fun blog! 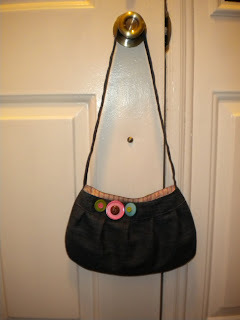 and i just finished making my 6th bag-w/the same pattern. i did the tab on the first one but didn't really like it, so i've been doing big frayed fabric flowers and i like that better. i do like the buttons though too-good idea! these have been b-day gifts for my friends/family. this year i've committed to doing only hand-made gifts. right now i'm doing pj bottoms for nephews. fun times! and i LOVE that jacket waimea!!! adorable! CUTE bag! Love the idea of this blog! :) Thanks for sharing! very cute bag! i have that pattern, but haven't made anything with it yet. maybe i will copy some of the changes you made!